In our previous post, we discussed how WooCommerce Orders page helps in reviewing order delivery details. Today we will have a look at how these order delivery details are viewed in the backend by admin using Order Delivery Date Pro for WooCommerce plugin. 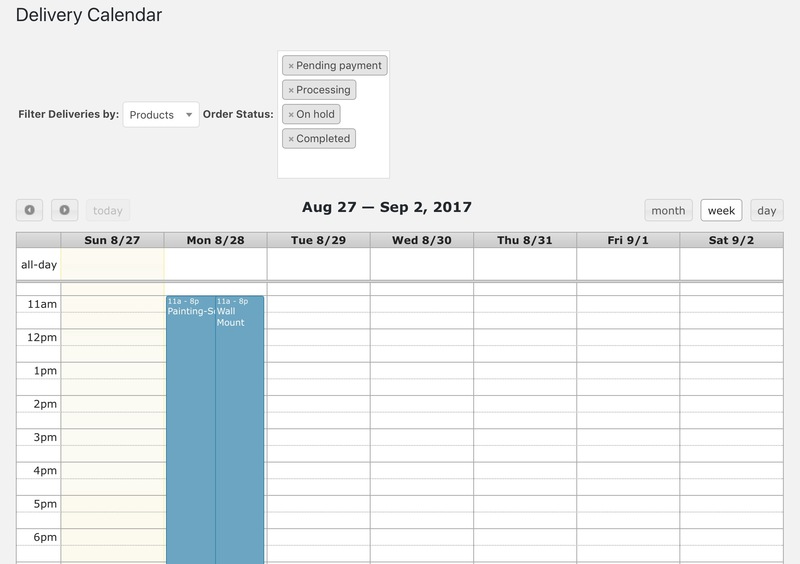 Once orders are placed, all its delivery details are seen in the backend under Delivery Calendar page. You can also filter and sort results as per the requirements. View monthly, weekly and daily orders swiftly along with it’s order status. 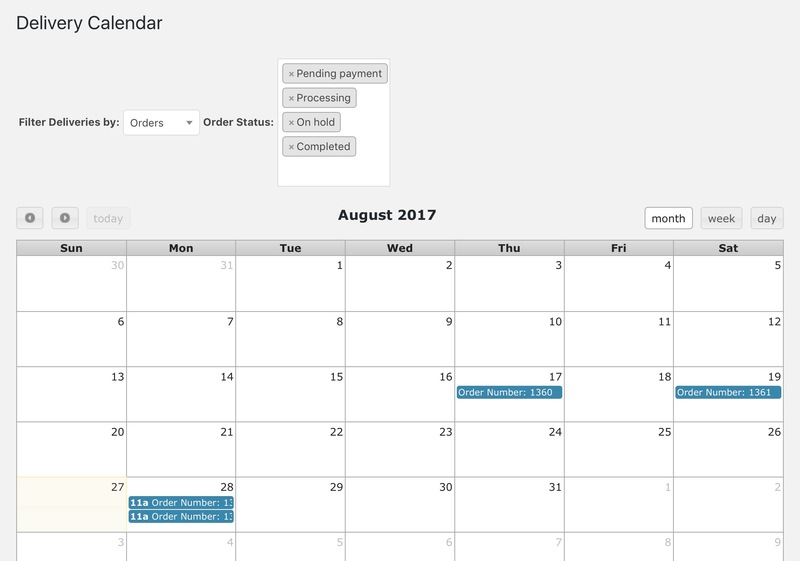 View Order Delivery Details part describes how you can view and sort all order deliveries together on the Delivery Calendar page. This functionality helps in reviewing different orders and its delivery details with an option to view them month wise, as per week or day wise. Thus allowing easy access to date and time data of order deliveries instantly. 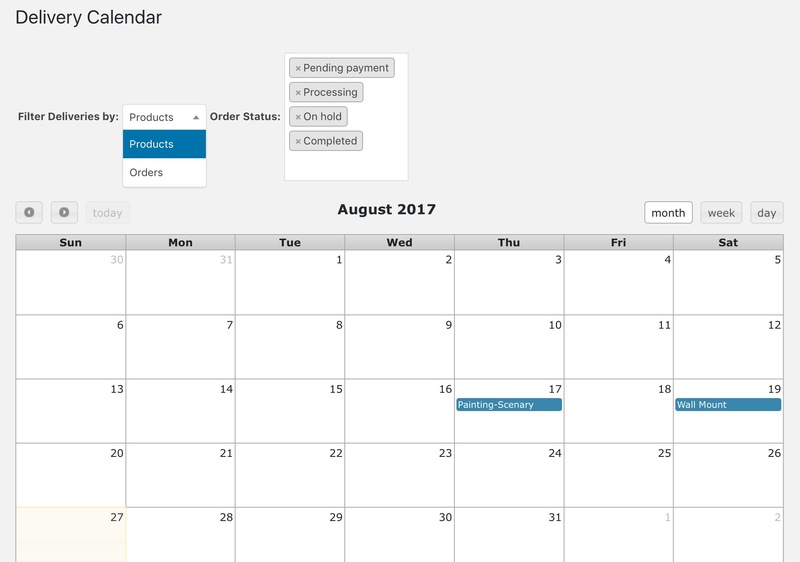 This shows there are 4 orders placed for the month of August out of which there are 2 orders for the same day which is 28th August. 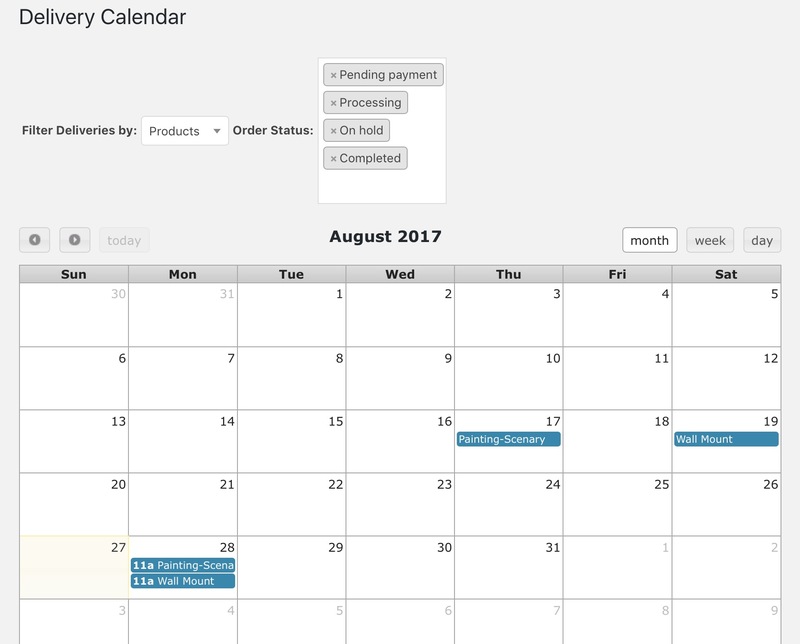 When more than one order is placed for the same day, both product names are shown together under the same date as shown in above image. The default filter option is set to Products. 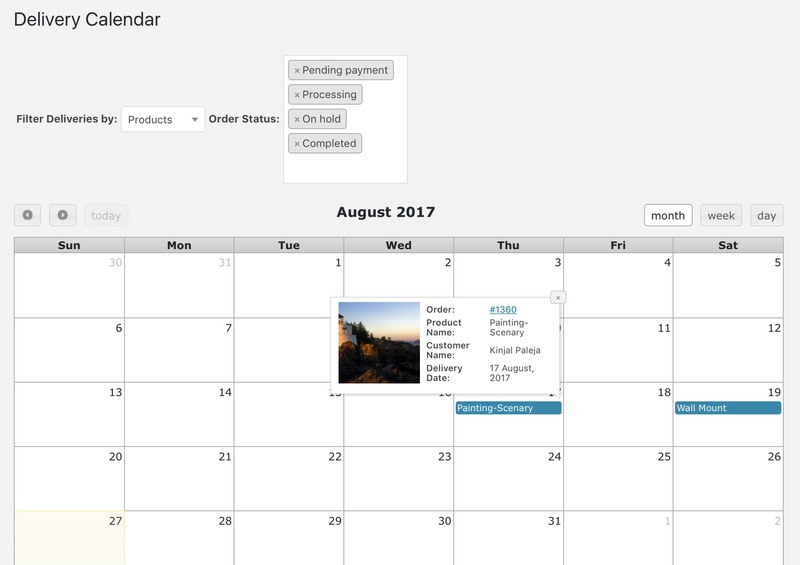 This means all the placed orders will be shown on the calendar with it’s product name displayed as shown in the above image. The main difference between the two filter options is that when a single order has 2 different products, then in the product view both events will be displayed for same order with different product names as shown in image no.5 above. Similarly if the Order option is selected, only 1 event will be displayed for single order number as shown in image no.10. If time slot is added then that will also be shown as the order of 28th August, otherwise the order will be displayed simply with just order number as shown for orders of 17th and 19th August in the above image. You can view details of this order when you hover the order numbers same as while using the product filter. As you can see in all images, there is an option of Order Status next to the filter option with all different order statuses displayed. This filter option is used by customers to filter the orders based on their order statuses. 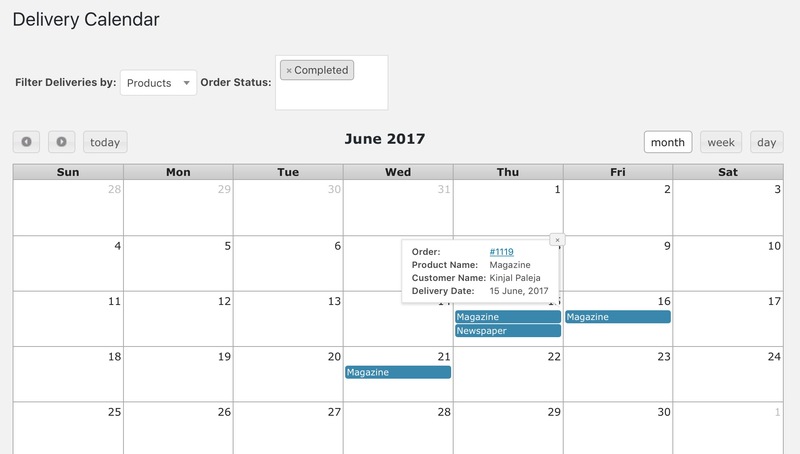 The image displays all completed orders for the month of June with all its delivery details shown when you mouse hover the product name. 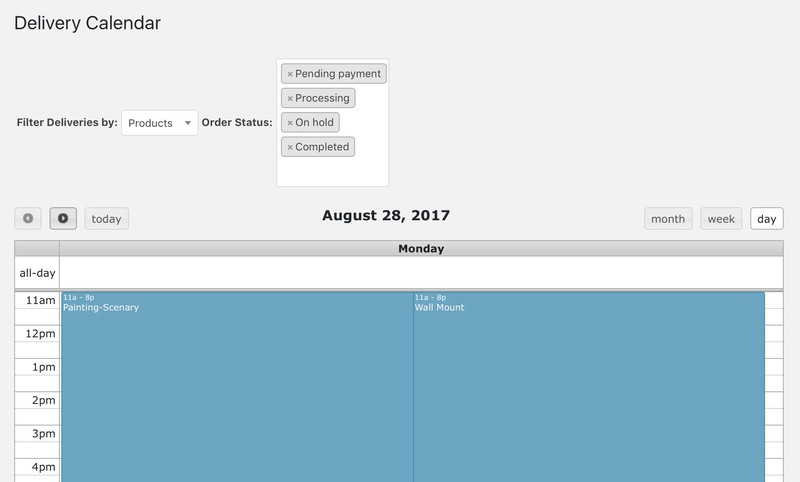 This way you can even have a look at all pending, on hold or in process orders. 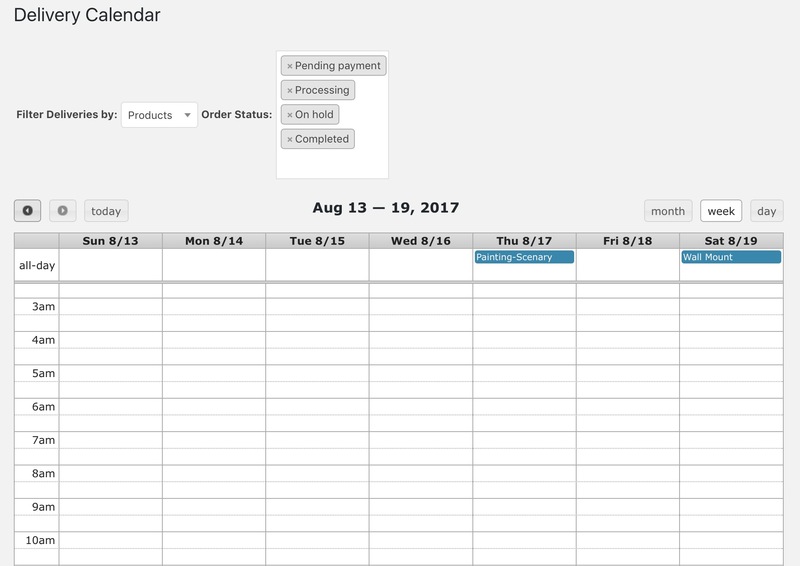 Thus you can quickly look at the calendar and figure out the sales for each month or the product that was sold the most. Order delivery process is made utmost simple and the most quickest in Order Delivery Date Pro for WooCommerce plugin. You are provided with ample of solutions with best practises and functionalities in this plugin which also helps tracking your sales and overall success of the business other than streamlining the order delivery process.